This red and pink 4x6 Vertical folder is a perfect giveaway for a Valentine's event, anniversary, cruise, dance, wedding and other special occasion. This Red and Pink Valentine Photo Folder is a perfect giveaway for your next Valentine's Day party or event and can also be used for anniversaries, cruises, dances, weddings and other special occasions. 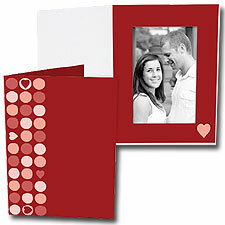 Our printed hearts photo folder displays a modern polka dots and hearts theme. Use as is or imprint with your company logo and text for your next hospital or healthcare promo.